We strive to optimize traffic flow on arterial streets, enhance roadway, neighborhood and school zone safety, and improve traffic management citywide. Through the implementation and maintenance of traffic tools and measures, we are able to improve roadway conditions, maximize intersection operations, heighten driver awareness, and increase public safety. Riverside introduces new traffic signals! The Riverside Public Works Department wants you to know how the new left turn signals work. These new signals will help improve traffic flow and increase driver and pedestrian safety. 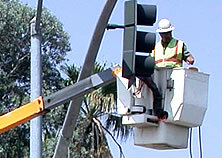 The Traffic Engineering Division is responsible for traffic signal maintenance at city intersections. To report a traffic signal problem please contact the 311 Call Center. New City standards call for pedestrian countdown display which have been installed at over 200 intersections, increasing pedestrian safety and understanding. Speed feedback signs act as traffic calming devices and help with speed control. The City of Riverside was recently recognized by both the State of California Assembly and Senate for its model program in rail safety developed through its partnership with Operation Lifesaver, Inc. Read more on rail safety. The City of Riverside's Bicycle Master Plan was adopted on May 22, 2007. The Master Plan provides a blue print for bicycle transportation and recreation in the City of Riverside and seeks to enhance and expand the existing bikeway network, connect gaps, address constrained areas and improve intersections, provide for local and regional connectivity, and encourage even more residents to bicycle. Read more on the City's Bike program.